Click on the photo to download the report. 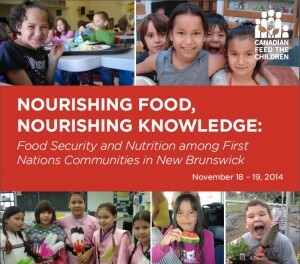 MONCTON, NB, November 18, 2014–Canadian Feed The Children is hosting its first-ever “Nourishing Food, Nourishing Knowledge” food security forum at Elsipogtog First Nation in New Brunswick on November 18th and 19th, 2014. The two-day event will bring CFTC First Nations partners from Tobique, Eel Ground and Elsipogtog First Nations in New Brunswick and from Chippewas of Nawash Unceded First Nation in Ontario together with other First Nations representatives, academics, and local food security networks. The goal is to promote knowledge sharing, strengthen relationships among participants for future collaborations, identify food and nutrition security resources for stronger programming and document the key factors that ensure effective school food programming and delivery in First Nations communities. CFTC has hosted a number of previous fora with representatives from First Nations partners, academia, and other non-profits who are involved in the food security movement in Canada. These earlier events were internally focused, designed to help shape CFTC’s increasing focus on child nutrition and nutrition education in its Canadian programming. However, a strong desire and need for coordination and collaboration emerged among the many stakeholders involved in First Nations food security at these earlier events, leading to the larger-scale November 2014 forum, which is also open to the public. As a further demonstration of its commitment to food security and issues of nutrition, education and food sovereignty in Canada, Canadian Feed The Children was also a sponsor of the Food Secure Canada Assembly.